What happens to old technology when we no longer find it useful? 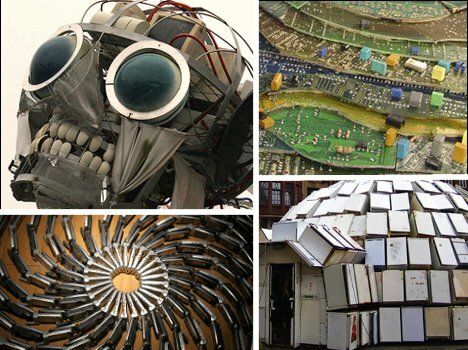 All too often, it ends up in landfills – but these inventive artists have found plenty of ways to give old machines new life. This stunning sculpture from English artist Keven Law is a behemoth at nearly 23 feet tall. 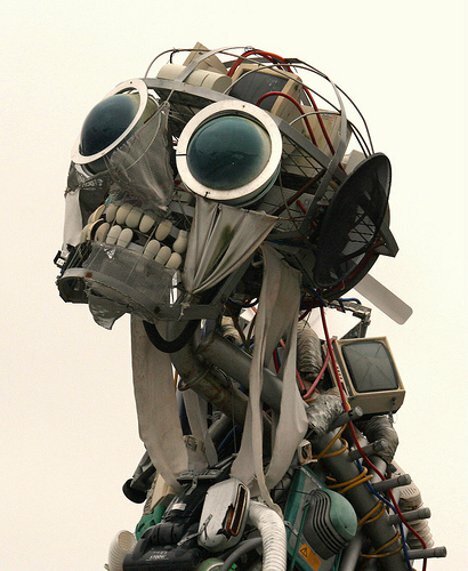 Its name, WEEE Man, is an allusion to the waste electrical and electronic equipment from which it is made. Among the old parts used in the piece’s construction are a ton of old household appliances, aged computer hardware, computer mice which form the teeth, and old washing machine doors that make up the haunting eyes. 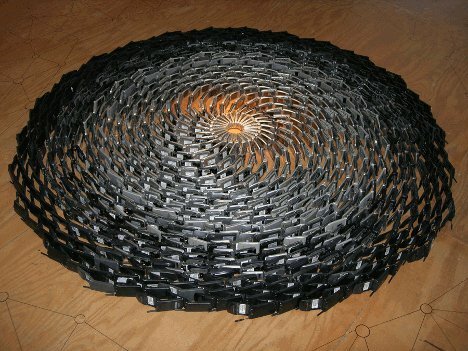 Artist Robert Pettit somehow manages to make old, obsolete cell phones look positively graceful. This beautiful and carefully constructed display is composed of 5,000 cell phones which were once destined for the landfill. Motorcycles are seen by many as the ultimate symbol of freedom, but how long will we be able to enjoy the open road if we keep loading up landfills with old technology at such an alarming rate? 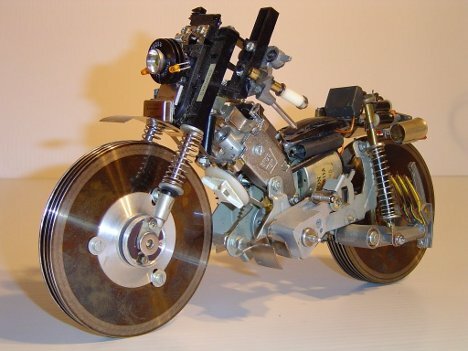 This sculpture from an artist known as Alex Andromeda uses pieces of old computers and VCRs and reincarnates them into a graceful new form. 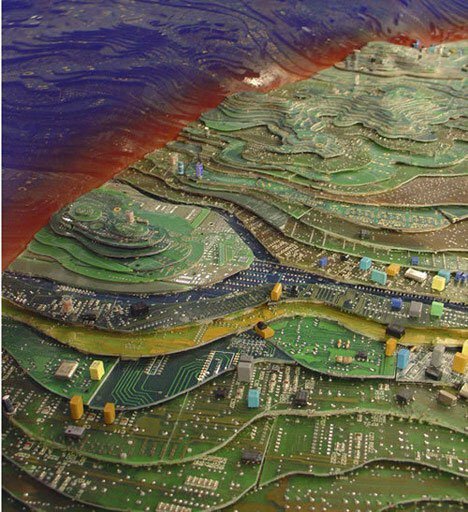 Looking almost like a topographic map of some urban landscape – complete with tiny buildings and unusually routed streets – this sculpture from Grace Grothous is actually a collection of old circuit boards. The tiny structures on its surface are the original circuits which used to usher data around for the circuit boards’ previous owners before they were discarded, presumably for newer models. The city center of Hamburg, Germany was temporarily adorned with this incredible sculpture made of 322 old refrigerators. 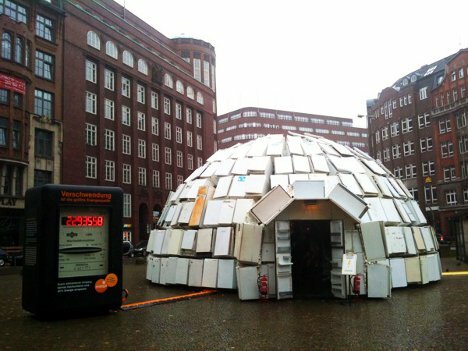 The sculpture from German artist Ralf Schmerberg was sponsored by the local utility company to display just how much energy older refrigerators waste. To illustrate the point, a large electricity meter was placed outside to measure how much power was running through the bizarre igloo.